The 21-year-old South London born singer and songwriter is quickly proving herself as one of the most exciting breakthrough artists of this year with tracks like Give Me Love and Adam and Eve garnering plenty of attention from the music fans and media including Jools Holland who described her as "wonderful" when she performed on his show last month. The twenty-one year old has also sold out two London headline shows, playing Hoxton Hall on November 25 and will spend the rest of this month touring with the likes of Foxes and Rudimental on sold out tours. Born to an Ethiopian mother and English father, Izzy’s rich cultural tapestry has informed her soulful pop soundscape. Growing up on a diet of Ella Fitzgerald, Amy Winehouse and Marvin Gaye, Izzy’s delicate acoustica threads those nostalgic funk-and-soul elements with a genuine indie spirit. If you see Izzy Bizu whizzing passed you on her Penny board, her Yorkie Poo dog Teddy for company, know that south London’s skateboarding soulstress is no one trick poppin’ pony. There’s layer to this. 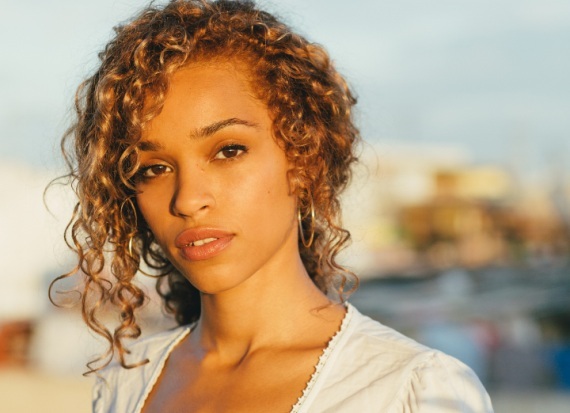 Whether Izzy Bizu is annihilating you at table tennis, kicking dust in your face at table football, or out styling you, you’ll still like her and that never-fading smile. A fan of jazz-fusion mixes and a lover of squat parties and warehouse raves, there’s never a dull day musically either. Not one to box herself in, she’s wise beyond her 21-years, a sentiment that reigns in both he songwriting, vocal and performance, and Izzy is just as likely to be jamming to The Black Keys, The Antlers, Grammatic or C2C as she is drawing influence from Amy Winehouse, Diana Ross and Sam Cook. Having already supported Sam Smith on his UK tour, anyone who sees her live will know she’s studied the greats - and has every intention of standing with them as she releases her debut album. Having garnered early support from 1Xtra and BBC Radio 1 on her 2013 independent six-tracker, Coolbeanz EP, since signing to Sony there’s been plenty a new fan in the front row thanks to ‘Adam & Eve’, an upbeat funk tinged big room offering, completed by its epic horn section. Drawing on her time moving countries, schools and the relationships that hav entailed, Izzy is a cultural explorer, memories, experience and feelingsevoking the songs we’re soon to hear and the thought-provoking conversation she already provides. Wearing her thoughts on her sleeve, you’ll be pushed to find many a debut this honest. Born to an Ethiopian mother and English father, who met on a charity walk, it was his career in civil engineering that saw Izzy and her older brother living in the Middle-East for four years, spending their free days playing rugby and cricket before settling in South London, the place the family still call home. Izzy flirted with dreams of musical grandeur during a brief stint at Stamford boarding school, where a teacher – on overhearing Izzy singing in her room – invited her to perform a rendition of ‘Amazing Grace’. But it was on joining Ravenscout Theatre School as a teenager that her love for poetry and an academic discipline to the arts was applied. Moving onto Tech Music School at 17, and after a brief dalliance with the now defunct Mercury Records as part of trio Soundgirl (a group she founded with her friends), it was sheer chance that would kick start Izzy Bizu’s solo career: Two years ago, through a family member, she found out her long-lost cousin whom she had never met, ran the seminal music showcasing event, ILuvLive, who have provided an early platform for acts including Jessie J, Maverick Sabre and Wretch 32. With nothing to lose she rocked up and hit the open mic session, winning the crown and plaudits from the audience who happened to include Naughty Boy and Emeli Sande (not a bad first co-sign, hey). With guidance and some much-needed advice, the debut EP was soon to come on the ILuvLive label. Collaborative downtime with her first love (and now best friend) Mika, a multi-instrumentalist in his own right, bore the fruits of the album. With hours spent perfecting the lyrics and melody, a roll call of some of the industry’s finest producers are responsible for sprinkling the final remnants of gold dust on what’s to come. Among them sit Luke Juby (Emeli Sande), Paul Herman (Corrine Bailey Rae), Justin Broad (Raleigh Richie), Ian Barter (Amy Winehouse), Adam Argyle (Olly Murs), Jimmy Hogarth (Sia) and Dan Grech (Lana Del Rey). Basically, if you’re looking for the real deal, you’ve found it. ‘Floating Lamps’ was written last year while chilling in her mother’s native Ethiopia. “I went there a lot when I was younger so I’m really familiar with the culture, it’s changed so much over the years. It’s a lot better than it used to be. Everyone thinks it’s poverty land but it’s so much more. It is truly amazing.” Lines like “I got smokes in my hand/ I’m feeling unsteady/ I can’t watch you stand…” reveal a young woman finding her way with the twists and turns that come with any great modern love story.